Brand new for 2017, Casimba is a user-friendly casino where the games load in seconds and there are plenty of helpful features such as quick-launch tutorial videos. The casino provides a hefty welcome bonus, along with a range of other regular promotions for active players. The name is inspired by the Swahili word for lion, “Simba”, and the London-based owners say that this indicates their determination to become kings of the casino industry. In the casino’s Camden offices, there are 22 full-time staff who speak a number of different languages, along with a team dedicated to retention and another for its VIP members. The online experience at Casimba is good over both mobile and desktop devices. Along with live casino games, there are upwards of 1,000 casino and slot titles from which to choose. Most players will be able to seek out their favourite games as well-established providers such as Evolution, Microgaming and NetEnt are all available. For people who prefer playing on a tablet, desktop or mobile, Casimba has all the bases covered. To keep patrons’ funds, secure and ensure that games are conducted fairly, Casimba is regulated in the UK by the UK Gambling Commission and also in Curaçao by the Curaçao eGaming Authority. Casimba players are rewarded every time they visit the site and place a wager. This is organised through a loyalty points scheme. Once a player’s loyalty points balance has reached a certain level, it can be exchanged for bonuses, which are shown in the My Account section. Players can simply choose the bonus they require from this area once they are eligible. Once 1,000 points have been earned, players are entitled to a £5 cash bonus. Every time £10 is wagered, members earn up to two points, though this varies depending on the game. New members are also given 500 loyalty points when they sign up and make their first deposit. VIP players are privy to a selection of other bonuses, including in-game rewards, tickets to events, cashback offers, and the chance to win big at private tournaments. The welcome bonus kicks in as soon as players make their first deposit. They can receive a sizable 200% of their payment, up to the value of £5,000. Along with the cash, they are entitled to 50 bonus spins and 500 loyalty points. When a second deposit is made, they are awarded another 50% of their payment up to £1,000, along with 50 extra spins for NetEnt games, including Twin Spin, Gonzo’s Quest and Starburst. The third deposit nets the final welcome bonus of a 75% boost to the payment up to £500, plus 25 more free spins on any NetEnt title. The player’s winnings from these bonus spins are capped at £100, and the maximum bet allowed from bonus funds is £5. If the bonus funds are not used within 30 days, then they are forfeit, as are spins that are not used within 72 hours. For the welcome bonus, the wagering requirement is 35 times the value of the bonus provided. An example of this requirement could be as follows: a member deposits £100 and then gets a bonus of £100, leaving them with a Bonus Balance of £200; on the slot games, they must now wager 35 times that amount, or a total of £3,500, to meet the requirements. When it comes to making up this amount, games are weighted differently, so players can check the terms of each one to discover what percentage they will contribute. Once the wagering requirements have been reached, the casino transfers a player’s funds from a Bonus Balance to a Cash Balance. This is when a player can withdraw their winnings. Casimba has curated quite a wide selection of promotions to keep its clients interested. Each month, the casino runs a Slot of the Month competition, which is won by a random player who has wagered at least £10 on the designated slot. The prizes vary from month to month, but they can include gadgets or tickets to sporting events. The Weekly Slots Tournament takes place each week and is awarded to the players who have wagered the most on a specific slot. The competition runs from Monday to the following Sunday and there are five winners in all. They are each given a £20 casino bonus. 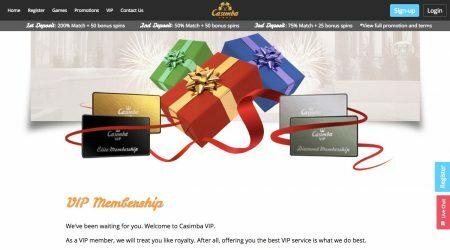 Holiday competitions are common at Casimba and these are worth up to £20,000, but if a winner would prefer, they are able to take 75% of the cash value instead. To enter, players must have earned 1,000 loyalty points at the casino within a month. Despite opening quite recently, Casimba has put together a comprehensive library of games, covering all the best-loved titles along with a plethora of others for members to try out. There are around 500 titles in all from many top software developers, and to make it easier to search the catalogue, each has been organised by group. 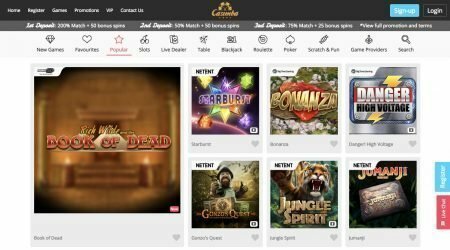 Players can check out New Games and use this as a place to bookmark titles, or go to Live Dealer, Table Games, Scratch and Fun, Jackpots or Slots. Members can log in to search for a provider, and they will be shown each game from that developer. When inspiration is needed, there is a Play a Random Game link that leads to a game chosen by the casino. People who go online to play slots will be pleasantly surprised by the huge selection at Casimba, as there are around 450 to be tried out. Variety is provided with a range of different themes, and new titles are regularly added, so the most recent releases are never too far away. There are plenty of obscure titles here for players who like to test out the unknown, but a reassuringly solid collection of the more popular ones is also available, such as Starburst, Foxin’ Wins, Fruit Warp and Irish Eyes. For the high rollers, there are 35 progressive jackpots that could net the larger rewards – these are made up of Treasure Nile, Mega Moolah and Tunzamunni, along with many more. Casimba has around 15 games at its live casino. 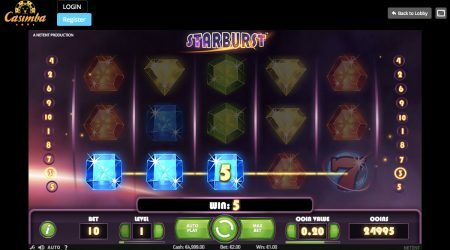 Five hail from NetEnt and the rest have been designed by Evolution Gaming. To please every type of player, the casino has tried to include as much variety as possible. There are a couple of roulette and blackjack options, along with Three Card Poker, Texas Hold’em, Casino Hold’em, standard baccarat and Caribbean Stud Poker. For players who like to break up the session a little, there is also a game called Dream Catcher, which involves spinning a wheel in real time to win immediate cash prizes. Casimba is just as serious about its table game spread, with more than 55 different options from which to choose. There are at least 14 different variants of roulette, along with poker games, blackjack, and others such as Red Dog and Sharpshooter. Whatever budget players come to the table with, they can have a good time at Casimba, as there are plenty of low-stake games, as well as a good selection of their high-stake counterparts. Modern online casinos have to provide plenty of choice when it comes to payment methods, as players tend to have individual preferences. At Casimba, the accepted methods are Maestro, Mastercard, Visa, iDEAL, paysafecard, Skrill and Neteller. Players who want to withdraw money will have it paid back to the deposit method they used or sent via bank transfer. 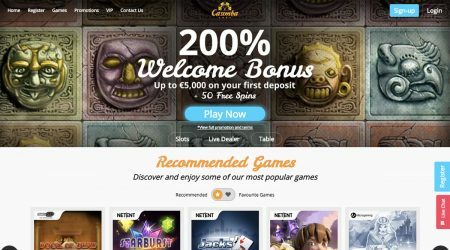 Casimba is a new entry into the world of online casinos, but so far it has proven itself to be a reliable choice for players who like to switch between slots, casino and live games. There is a very wide selection of titles in each area of the site, and these are easy to access using the helpful search feature. Casinos do not last long without the correct authorisation, as customers are wary of depositing their funds, but Casimba is regulated by two of the biggest names in the business. Between them, the UK Gambling Commission and the Curaçao eGaming Authority check that games are conducted properly, and the financial side of things is secure. Furthermore, Casimba has invested in a multilingual team of staff who may not answer live chat requests immediately but are knowledgeable enough to help when players eventually get through. For players who appreciate a large welcome offer and continued promotions, along with a wide selection of big-money jackpots, Casimba won’t disappoint.